A crucial factor in the development of Roman architecture and building, which saw a trend toward monumental architecture, was the invention of Roman concrete (opus caementicium), which led to the liberation of shapes from the dictates of the traditional materials of stone and brick. One does nto normally think of concrete when thinking of ancient buildings and civilization, but when it comes to Rome and the Romans... yeah, think concrete. The Pantheon is a former Roman temple, now a church, in Rome, Italy, on the site of an earlier temple commissioned by Marcus Agrippa during the reign of Augustus (27 BC ? ? 14 AD). The present building was completed by the emperor Hadrian and probably dedicated about 126 AD. He retained Agrippa's original inscription, which has led to confusion as to its date of construction, as the original Pantheon burnt down, so it is not certain when the present one was built. The building is circular with a portico of large granite Corinthian columns (eight in the first rank and two groups of four behind) under a pediment. A rectangular vestibule links the porch to the rotunda, which is under a coffered concrete dome, with a central opening (oculus) to the sky. Almost two thousand years after it was built, the Pantheon's dome is still the world's largest unreinforced concrete dome. The height to the oculus and the diameter of the interior circle are the same, 142 feet (43 m). 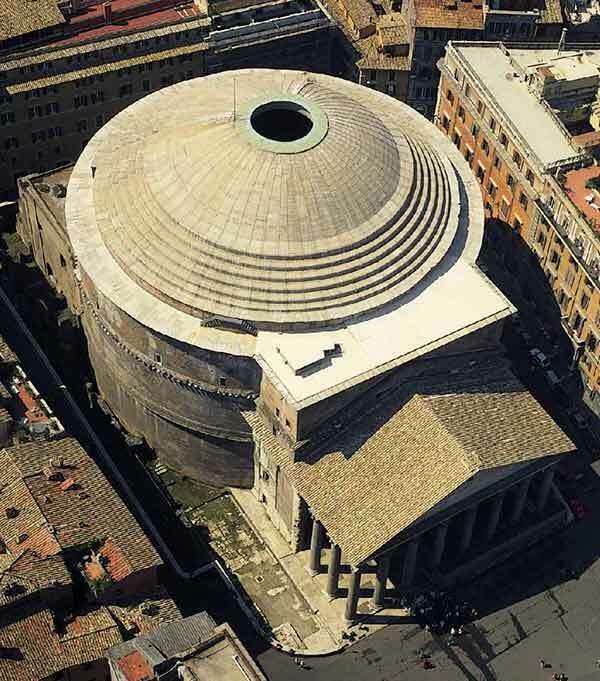 It is one of the best-preserved of all Ancient Roman buildings, in large part because it has been in continuous use throughout its history, and since the 7th century, the Pantheon has been used as a church dedicated to "St. Mary and the Martyrs" (Latin: Santa Maria ad Martyres) but informally known as "Santa Maria Rotonda". Although concrete had been used on a minor scale in Mesopotamia, Roman architects perfected Roman concrete and used it in buildings where it could stand on its own and support a great deal of weight. The first use of concrete by the Romans was in the town of Cosa sometime after 273 BC. Ancient Roman concrete was a mixture of lime mortar, aggregate, pozzolana, water, and stones, and was stronger than previously-used concretes. The ancient builders placed these ingredients in wooden frames where they hardened and bonded to a facing of stones or (more frequently) bricks. The aggregates used were often much larger than in modern concrete, amounting to rubble. 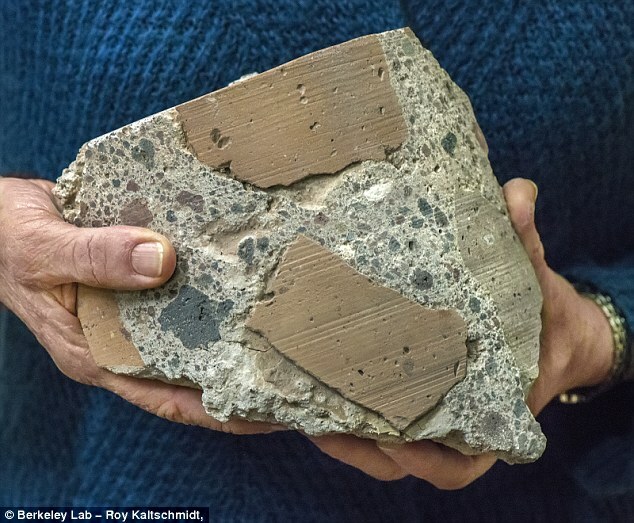 Coarse chunks of volcanic tuff (and brick compose about 45 to 55 per cent of the concrete, resulting in what the researchers claim are significant reductions in carbon emissions. Tuff (from the Italian tufo) is a type of rock made of volcanic ash ejected from a vent during a volcanic eruption. Following ejection and deposition, the ash is compacted into a solid rock in a process called consolidation. Tuff is sometimes called tufa, particularly when used as construction material, although tufa also refers to a quite different rock. Rock that contains greater than 50% tuff is considered tuffaceous. 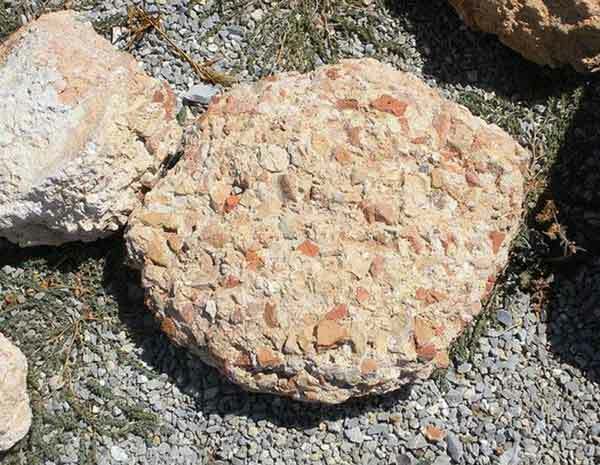 Tuff is a relatively soft rock, so it has been used for construction since ancient times. The walls were made with a wooden form or framework. When the form was removed, the new wall was very strong, with a rough surface of bricks or stones. This surface could be smoothed and faced with an attractive stucco or thin panels of marble or other coloured stones called revetment. Concrete construction proved to be more flexible and less costly than building solid stone buildings. The materials were readily available and not difficult to transport. The wooden forms could be used more than once, allowing builders to work quickly and efficiently. 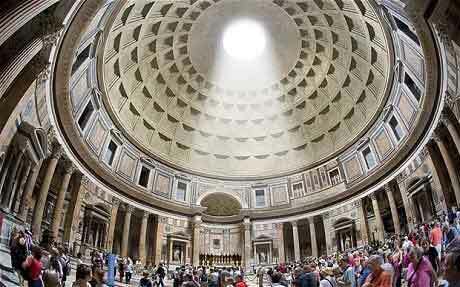 Concrete is arguably the Roman contribution most relevant to modern architecture. 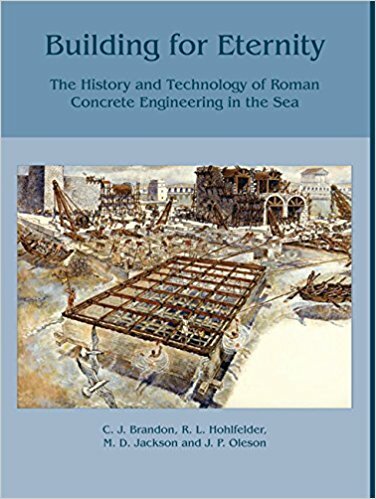 Here's a great video showing Roman concrete being made. This guy is the best presenter on Roman stuff. I miss his show.